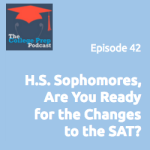 42: Are You Ready for the Changes to the SAT, High School Sophomores? Colle ge Board is rolling out drastic changes to the SAT starting next spring, which will have grave effects for current high school sophomores (and other students too). Tune in to today’s episode to find out what to do about these changes so students don’t hurt their changes at college success. If you’re interested in sessions with Megan to help you make your plan of action for acing the SAT, please visit her website.